Data Structures are the programmatic way of storing data so that data can be used efficiently. Almost every enterprise application uses various types of data structures in one or the other way. Each element can be accessed via its index. i.e. array gives 19. Linked list can be visualized as a chain of nodes, where every node points to the next node. Simple Linked List − Item navigation is forward only. Doubly Linked List − Items can be navigated forward and backward. Circular Linked List − Last item contains link of the first element as next and the first element has a link to the last element as previous. Adding a new node in linked list is a more than one step activity. We shall learn this with diagrams here. First, create a node using the same structure and find the location where it has to be inserted. If we are inserting a node NewNode, between LeftNode and RightNode. Then point NewNode->next to RightNode. This will generate the following link between new and right node. Now, the next node at the left should point to the new node. Similar steps should be taken if the node is being inserted at the beginning of the list. While inserting it at the end, the second last node of the list should point to the new node and the new node will point to NULL. Deletion is also a more than one step process. We shall learn with pictorial representation. First, locate the target node to be removed, by using searching algorithms. The left node of the target node now should point to the right node of the target node. We can keep that node in memory otherwise we can simply deallocate memory and wipe off the target node completely using free() function in c++. In singly Circular linked list, the next pointer of the last node points to the first node. A stack can be implemented by means of Array, Structure, Pointer, and Linked List. Stack can either be a fixed size one or it may have a sense of dynamic resizing. Here, we are going to implement stack using arrays, which makes it a fixed size stack implementation. push() − Pushing (storing) an element on the stack. pop() − Removing (accessing) an element from the stack. 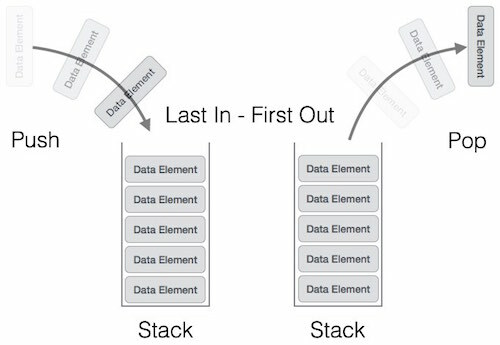 top() − get the top data element of the stack, without removing it. isFull() − check if stack is full. isEmpty() − check if stack is empty. 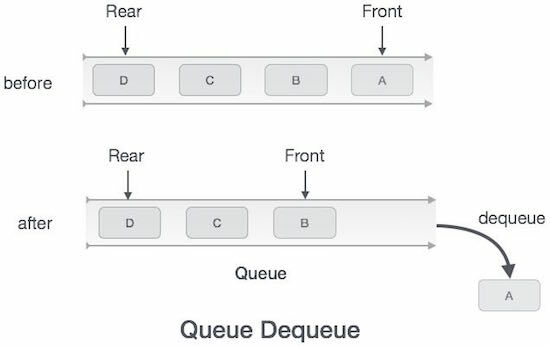 As in stacks, a queue can also be implemented using Arrays, Linked-lists, Pointers and Structures. For the sake of simplicity, we shall implement queues using one-dimensional array. front() − Gets the element at the front of the queue without removing it. 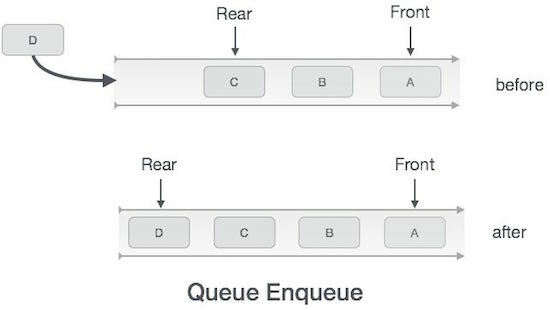 Queues maintain two data pointers, front and rear. Therefore, its operations are comparatively difficult to implement than that of stacks. Step 3 − If the queue is not full, increment rear pointer to point the next empty space. Sometimes, we also check to see if a queue is initialized or not, to handle any unforeseen situations. Step 3 − If the queue is not empty, access the data where front is pointing. insertFront(): Adds an item at the front of Deque. insertLast(): Adds an item at the rear of Deque. deleteFront(): Deletes an item from front of Deque. deleteLast(): Deletes an item from rear of Deque. getFront(): Gets the front item from queue. getRear(): Gets the last item from queue. isEmpty(): Checks whether Deque is empty or not. isFull(): Checks whether Deque is full or not. In this traversal method, the left subtree is visited first, then the root and later the right sub-tree. 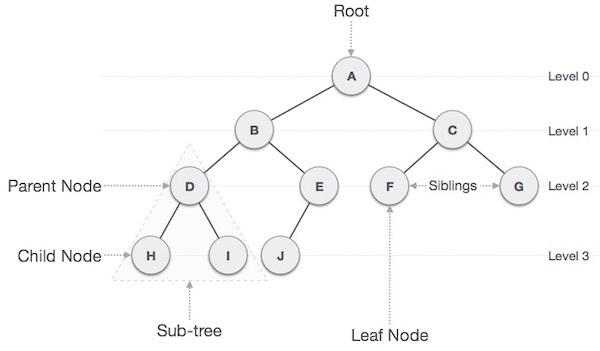 We should always remember that every node may represent a subtree itself. If a binary tree is traversed in-order, the output will produce sorted key values in an ascending order. Step 1 − Recursively traverse left subtree. Step 2 − Visit root node. Step 3 − Recursively traverse right subtree. 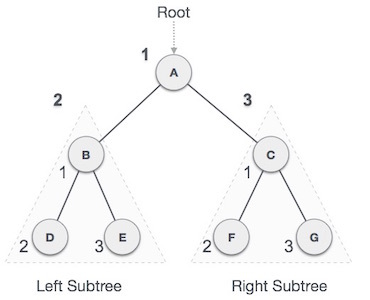 In this traversal method, the root node is visited first, then the left subtree and finally the right subtree. Step 1 − Visit root node. Step 2 − Recursively traverse left subtree. In this traversal method, the root node is visited last, hence the name. First we traverse the left subtree, then the right subtree and finally the root node. Step 2 − Recursively traverse right subtree. Step 3 − Visit root node. To search a given key in Binary Search Tree, we first compare it with root, if the key is present at root, we return root. If key is greater than root’s key, we recur for right subtree of root node. Otherwise we recur for left subtree. A new key is always inserted at leaf. We start searching a key from root till we hit a leaf node. Once a leaf node is found, the new node is added as a child of the leaf node. When we delete a node, three possibilities arise. 1) Node to be deleted is leaf: Simply remove from the tree. 1) Find inorder successor of the node. 2) Copy contents of the inorder successor to the node and delete the inorder successor. Note that inorder predecessor can also be used. The important thing to note is, inorder successor is needed only when right child is not empty. In this particular case, inorder successor can be obtained by finding the minimum value in right child of the node. struct node*temp=findMin(root->right);                    ///finding inorder succesor which is minimum of right node.